Tired of playing the same old tunes? Take your guitar skills to new heights with expert 1-2-1 guitar lessons. Whatever your age or level, well-structured, highly focused guitar lessons will transform your playing. From technique to music theory, learn everything you always wanted and get good! Book a Guitar Lesson Now! Rock, pop, blues or jazz electric guitar lessons. Learn hundreds of great guitar tunes. Play with speed, accuracy and style. Learn to improvise creatively and authentically. Make sense of chords, scales and arpeggios, and acquire advanced rock techniques. In these acoustic guitar lessons you’ll learn every chord you’ll ever need and a huge repertoire from across the decades. Develop your skills to achieve advanced level musicianship. In these classical guitar lessons, you’ll learn the ABRSM guitar grades; including repertoire, sight-reading, aural training, scales and arpeggios. Upgrade your technique, master music theory, become a well-rounded guitarist. Within 12 months I was confidently playing some of my favourite songs. Stuart really takes time getting to know your strengths and weaknesses and working on them to improve constantly. Stuart not only can play the guitar and teach other people, he also has fantastic knowledge of musical theory which is incorporated into the songs you learn helping me to understand why certain notes sound better together etc. I would certainly recommend anyone who is even thinking about giving the guitar (acoustic or electric) a go, getting in touch and speaking with Stuart and as a previous reviewer stated he spends time replying to your e-mails and putting your mind at ease before making the decision. I am a 100% satisfied student! I highly recommend Stuart as a guitar teacher. His lessons are well prepared, well structured, and he is able to draw on a large amount of high quality teaching materials built up over many years of teaching at his home in Ealing. He is also patient, gives his full attention during lessons, and is easy to get along with. Importantly, his musicianship is second to none. As a result, my ability to play rock, blues, pop and other genres has progressed enormously in the space of just one year. 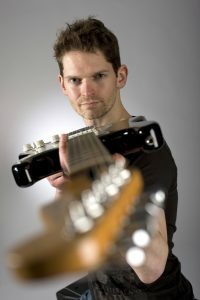 In summary, if you are looking for a top notch guitarist who can play guitar across different genres brilliantly and with flair, and who has a passion for teaching, then Stuart is by far your best option. Whether you are a complete beginner or a professional musician, Stuart will help you take your playing to the next level and beyond. He's also a very nice guy! I have been receiving guitar tuition from Stuart regularly for over a year now. Stuart is a great teacher. He has many different methods that has helped me understand what I have found difficult. He lets me go at a steady pace so I get as much from the lesson as possible. His lessons are both insightful and enjoyable. Not only has Stuart helped me improve my playing, he has helped me understand music theory on a whole new level. So I can apply that to my playing which is something I thought I could have never accomplished. I am so please with the results I have recommended Stuart for a guitar teacher on countless occasions. I was bought lessons for my birthday after wanting to learn guitar properly for years. I'd tried learning on my own through books, online courses and DVDs. They were never good enough and I realised why after my first lesson with Stuart. Stuart is a gifted teacher. He has made learning guitar effortless, entertaining and managed to make a life time goal achievable in just a few months. I am shocked and suprised every week at how much I've learned through Stuart's teaching and in such a short time. I'm playing songs I'd never dreamed I could. I can't thank him enough. Looking forward to my next lesson. He is very patient and the classes are very well prepared. Stuart's advice had an immediate impact on my way of playing guitar. Also, the classes are very practical and fun, you almost don't feel the time passing by! On a personal level Stuart is a great guy, very approachable and friendly. I very much enjoy taking classes with him and I thoroughly recommend him! Stuart's guitar tuition is excellent! Stuart is without doubt a top notch guitar teacher. In the 9 months of lessons I've had, I've seen massive improvements in my playing, well beyond what I was expecting. Lessons are focused and very well organised, practice material is never boring and is tailored to each students individual needs rather than a 'one size fits all' approach. I have been having tuition with Stuart for about 3 years now and find his lessons fast paced and invigorating. But more importantly, at the end of them it gives me the enthusiasm to go home and practice, which is more than half the battle. I would certainly recommend him to anyone wishing to better themselves on the guitar. He's a nice bloke too! I had been trying to teach myself guitar for a number of years with a limited amount of success. Since taking lessons with Stuart, my playing has improved no end with specific and tailored exercises designed to advance my skills in a fun and engaging way. Stuart's knowledge of musical theory, advanced techniques and his extensive collection of practice materials give me real confidence that my playing will only continue to improve. You will learn a vast amount in a short space of time and excel beyond your own expectations - guaranteed! If you are already advanced he will help to push you to your greatest potential. He has a well structured methodical approach to teaching which is both fun and challenging. He helps you to connect with the guitar in a way that encourages your own confidence and knowledge as a musician, whether you are playing for fun as a hobby or professionally. I always leave my lessons feeling that i accomplished something new, with an eagerness to learn more. Highly Recommended!!! Stuart Bahn is truly an excellent teacher! “Some professional guitarists teach guitar lessons grudgingly, to help make ends meet. That’s not so for me. I’ve always enjoyed teaching guitar. “I like the challenge of fixing people’s technique problems, timing issues, teaching the skills of improvisation and how music works. Stuart’s guitar lessons take place in South Ealing, close to South Ealing Tube Station (Piccadilly Line). There are good public transport connections courtesy of the 65, E3 and E2 buses. And there is free local parking. To book a guitar lesson with Stuart, or to ask a question about taking lessons, send an email using the button below.